Lenovo ThinkAgile HX Series appliances combine industry-leading hyperconvergence software from Nutanix with Lenovo enterprise platforms that feature Intel Xeon Processor Scalable family. These appliances deliver the industry’s most feature-rich hyperconverged infrastructure to enterprise datacenters, bringing the benefits of web-scale technologies to enterprise applications through enterprise storage, data protection, infrastructure resilience, management and analytics, and security. This product guide provides essential technical and pre-sales information on the Lenovo ThinkAgile HX7820 appliance, its key features and specifications, components and options, and configuration guidelines. This guide is intended for technical specialists, sales specialists, sales engineers, IT architects, and other IT professionals who want to learn more about the ThinkAgile HX7820 appliance and consider its use in IT solutions. The ThinkAgile HX7820 is a 4U rack-mount appliance that supports four processors, up to 6 TB of 2666 MHz TruDDR4 memory, 16x SAS/SATA and 8x AnyBay SFF hot-swap drive bays with an extensive choice of SAS/SATA SSDs and SAS HDDs, and flexible network connectivity options with 1/10 GbE RJ-45, 10 GbE SFP+, and 10/25 GbE SFP28 ports. Several common uses for the ThinkAgile HX7820 appliance that is optimized for high-performance workloads include databases, e-mail and collaboration, and workload-balancing clusters. 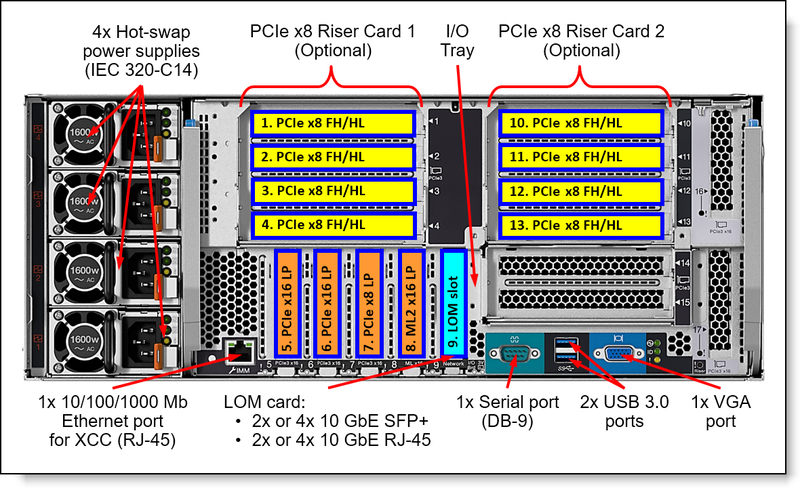 The ThinkAgile HX7820 appliance is shown in the following figure. The ThinkAgile HX Series appliances are built on industry-leading Lenovo ThinkSystem servers that feature enterprise-class reliability, management, and security. The ThinkAgile HX Series appliances offer ThinkAgile Advantage Single Point of Support for quick 24/7 problem reporting and resolution. Factory-integrated, pre-configured ready-to-go appliances built on proven and reliable Lenovo ThinkSystem servers that provide compute power for a variety of workloads and applications and powered by industry’s most feature-rich hyperconverged infrastructure software from Nutanix. Provide quick and convenient path to implement a hyperconverged solution powered by Nutanix with "one stop shop" and a single point of contact provided by Lenovo for purchasing, deploying, and supporting the solution. Meet various workload demands with cost-efficient hybrid or performance-optimized all-flash storage configurations. Offer Lenovo deployment services to get customers up and running quickly. The following figure shows the front view of the HX7820 appliance. The following figure shows the rear view of the HX7820 appliance. The following table lists the system specifications of the ThinkAgile HX7820 appliances. 2 cache drives and from 4 to 10 capacity drives in increments of 2 drives. Note: All SSDs in the appliance must be of the same model and capacity. All HDDs in the appliance must be of the same type and capacity. 2x or 4x optional 10 GbE SFP+, or 2x, 4x, 6x, or 8x optional 25 GbE SFP28 expansion network ports. Systems management XClarity Controller (XCC) Enterprise (Pilot 4 chip), proactive platform alerts, light path diagnostics, XClarity Provisioning Manager, XClarity Administrator and XClarity Pro. XClarity Energy Manager (optional). Software Nutanix Acropolis: Starter, Pro, and Ultimate editions. Nutanix Prism, Nutanix Calm (optional), Nutanix Flow (optional). Hardware warranty Three-, four-, or five-year customer-replaceable unit and onsite limited hardware warranty with ThinkAgile Advantage Support and selectable service levels: 9x5 next business day (NBD) parts delivered, 9x5 NBD onsite response, 24x7 coverage with 2-hour or 4-hour onsite response, or 6-hour or 24-hour committed repair (select countries). Also available are 1-year or 2-year post-warranty extensions, YourDrive YourData, and Premier Support. Software maintenance Three-, four-, or five-year software support and subscription (matches the duration of the selected warranty period). Note: You are required to engage a Lenovo representative in the project that includes the ThinkAgile HX Series appliances. The following table lists the base CTO model of the ThinkAgile HX7820 appliance. The following table lists the base chassis for the HX7820 appliance. It is possible to perform a hardware upgrade after the initial deployment, such as adding more memory or network adapters, by purchasing the hardware upgrade option listed in the following table. Configuration note: You should request a quote for the Nutanix HW Upgrade part number from Lenovo and provide additional details on the existing installation and planned upgrade. The ThinkAgile HX7820 appliance ships with four processors. The following table lists the processor options that are available for selection. The following table lists the specifications of the processors for the appliances. The ThinkAgile HX7820 appliances support Lenovo TruDDR4 memory. TruDDR4 memory uses the highest-quality components sourced from Tier 1 DRAM suppliers and only memory that meets strict requirements is selected. It is compatibility tested and tuned to maximize performance and reliability. The ThinkAgile HX7820 appliances support 24 or 48 DIMMs. Each processor has six memory channels, and there are two DIMMs per channel. The appliance supports RDIMMs, LRDIMMs, or 3DS RDIMMs. All DIMMs in the appliance must be of the same type (RDIMMs, LRDIMMs, or 3DS RDIMMs). All DIMMs in the appliance operate at the same speed up to 2666 MHz, which is determined by the maximum memory speed supported by the specific processor. The following table lists memory selection options available for the HX7820 appliance. It is possible to expand memory capacity after the initial deployment by adding more memory DIMMs to match one of the supported memory configurations and acquiring additional memory capacity license options listed in the following table. The ThinkAgile HX7820 appliance provides 16x SAS/SATA and 8x AnyBay SFF hot-swap drive bays for configurable storage capacity, and it contains two internal M.2 SATA non-hot-swap SSDs configured in a RAID-1 drive group for software preload. The following table lists the internal storage options for the HX7820 appliance. The following table lists the storage controllers for internal storage of the HX7820 appliance. 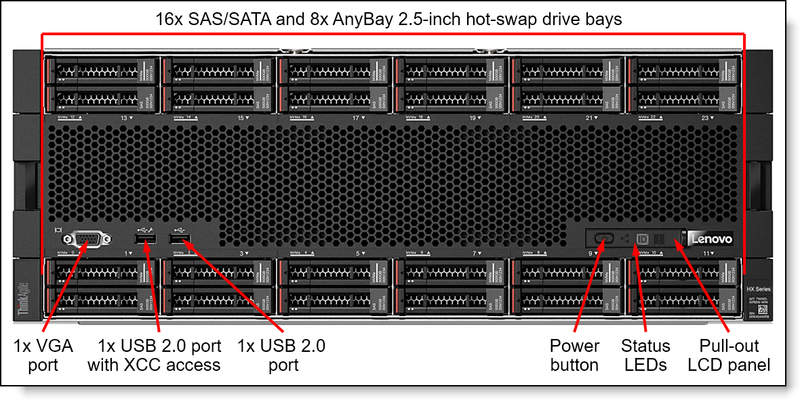 For All Flash configurations, the HX7820 appliance supports from 6 to 24 SSDs in increments of 2 drives. All SSDs in the appliance must be of the same model and capacity. All HDDs in the appliance must be of the same type and capacity. It is possible to expand storage capacity after the initial deployment by adding more drives to match one of the supported storage configurations and acquiring additional storage capacity license options listed in the following table. The ThinkAgile HX7820 appliances provide base two- or four-port 1/10 GbE RJ-45 or 10 GbE SFP+ network connectivity with the onboard Intel X722 NIC and a LOM card installed in the appliance. Two or four additional 10 GbE SFP+, or two additional 10/25 GbE SFP28 expansion ports can be selected, if required. One, two, three, or four 25 GbE network adapter: PCIe slots 5, 6, 12, 13, 11, 7. One, two, three, or four 25 GbE network adapter: PCIe slots 5, 6, 12, 13, 4, 11. It is possible to increase the number of network ports after the initial deployment by adding more network adapters to match one of the supported network adapter configurations and acquiring additional network adapter license options listed in the following table. The ThinkAgile HX7820 appliances ship with four 1600 W (230V) High Efficiency hot-swap power supplies listed in the following table. The ThinkAgile HX7820 appliances ship with four customer-configured power cords. The following table lists the rack power cables and country-specific line cords that can be ordered for the HX7820 appliances. The HX7820 appliances ship with the rail kit shown in the following table. * While certain servicing tasks require the appliance to be removed from the rack cabinet, the majority of appliance components can be serviced from the front or rear of the appliance, which does not require the removal of the appliance from the rack cabinet. The ThinkAgile HX7820 appliances can be configured with one of the Nutanix software editions that are listed in the following table. The Nutanix software is factory-preloaded and the appropriate license can be downloaded from the Nutanix website to match the serial number of the appliance. Configuration note: The HX7820 appliances can be deployed as a cluster of 3 or more nodes. The Starter edition offers the core set of Nutanix software functionality. This edition is ideal for small-scale deployments with a limited set of workloads. The Pro edition offers rich data services, along with resilience and management features. This edition is ideal for enterprises running multiple applications on a Nutanix cluster or with large-scale single workload deployments. The Ultimate edition offers the full suite of Nutanix software capabilities to tackle complex infrastructure challenges. This edition is ideal for multi-site deployments. It is possible to upgrade a software edition after the installation by purchasing one of the software upgrade options listed in the following table (one option per cluster node that is being upgraded). Configuration note: You should request a quote for the selected Nutanix SW Upgrade part number from Lenovo and provide additional details on the existing installation and planned upgrade. The following table compares features of the Nutanix software editions. * Requires a separate license. ^ Software-based encryption that uses standard drives. The following table lists optional software licenses that are available for selection. The optional Nutanix AFS license is available for selection as an add-on for the Nutanix Starter and Pro software editions. The optional Nutanix REP and Nutanix ENC licenses are available for selection as add-ons for the Nutanix Pro software edition. The Nutanix REP license includes the multiple site DR, metro availability, and synchronous replication and disaster recovery features. Nutanix Prism gives administrators an easy way to manage virtual environments running on Acropolis, and it simplifies and streamlines common workflows for hypervisor and virtual machine lifecycle management. Prism Starter (included in Starter, Pro, and Ultimate Nutanix software editions): Provides ability to configure, manage, and monitor a Nutanix cluster and centralized management of multiple local and remote Nutanix clusters. Prism Pro (Selectable software license; optional): Enables efficiency evaluation, capacity planning, expansion recommendations, custom dashboards, and advanced search capabilities. The Prism Pro software license can be selected during the initial purchase. Also, Prism Starter can be upgraded to Prism Pro after the initial deployment by purchasing one of the software license options listed in the following table. Configuration note: You should request a quote for the selected Prism Pro part number from Lenovo and provide additional details on the existing installation. Fully automates the provisioning, scaling, and deletion of traditional multi-tiered applications and distributed services. Simplifies the set-up and management of custom enterprise applications by incorporating all elements of each application, including relevant VMs, configurations, and related binaries, into an easy-to-use-blueprint. Publishes blueprints through the Nutanix Marketplace, giving end users the ability to request IT services that can then be instantly provisioned. Maintains control with role-based governance that limits user operations based on permissions and logs all activities for end-to-end traceability. The Calm software is licensed on a per-VM basis. The Calm software licenses can be selected during the initial purchase or can be added after the initial deployment in 25 VM packs by purchasing one of the software license options listed in the following table. Calm supports the AHV and ESXi hypervisors. When adding the Calm software licenses after the initial deployment, customers should request a quote for the selected Calm part number from Lenovo and provide additional details on the existing installation. Real-time visualization of communications between VMs helps implement appropriate network policies in a Nutanix environment. Micro-segmentation provides granular control and governance of all traffic into and out of a virtual machine with network policies attached to individual VMs and applications, rather than specific network segments. API-based notifications enable third party network devices to automate network configuration changes, such as VLAN provisioning or policy updates, in response to VM lifecycle events, such as adding a new VM. Service insertion and chaining enables virtualized network functions from third-party software (such as virtual firewalls and load balancers) to be deployed with VM traffic in a Nutanix environment. The Flow software is licensed on a per-node basis. The Flow software license can be selected during the initial purchase or can be added after the initial deployment by purchasing one of the software license options listed in the following table. Flow supports the AHV hypervisors only. When adding the Flow software licenses after the initial deployment, customers should request a quote for the selected Flow part number from Lenovo and provide additional details on the existing installation. VMware vCenter Server provides centralized management of vSphere environments to simplify day-to-day operations and reduce the complexity of managing virtual infrastructure. vCenter Server is a required component for deploying HX Series appliances in ESXi-based environments. Centralized management of virtualized hosts and virtual machines from a single console. Centralized inventory of virtual machines, hosts, datastores and networks. Alerts and notifications can trigger automated workflows to remedy and preempt problems. Host profiles standardize and simplify configuration and management of VMware ESXi hosts. Resource management for virtual machines allows to control allocation of processor, memory, disk and network resources. Automatically restarts virtual machines that have failed without manual intervention with VMware vSphere HA. Maintains records of significant configuration changes and exports reports for event tracking. Patch management enforces compliance to patch standards through automated scanning and patching of online ESXi hosts and select Microsoft and Linux virtual machines. The ThinkAgile HX appliances contain Lenovo XClarity Controller (XCC) Enterprise, which provides advanced service-processor control, monitoring, and alerting functions. The HX7820 appliances include basic light path diagnostics, which provides the system LEDs on the front of the appliance (see Components and connectors) and the LEDs near the monitored components (for example, the DIMM error LEDs on the system board). Also, the appliances offer an LCD display panel, which provides quick access to system status, firmware, network, and health information. Lenovo XClarity Administrator is an optional software component for the ThinkAgile HX Series appliances which can be used to manage firmware upgrades outside of the Nutanix Prism software. Lenovo XClarity Administrator can be downloaded and used at no charge to discover and monitor HX Series appliances and manage firmware upgrades for them. Note: If the 4-year warranty is selected for the appliance, the XClarity Pro license will include five years of software support. Lenovo XClarity Energy Manager provides a stand-alone, web-based agent-less power management console that provides real time data and enables you to observe, plan and manage power and cooling for Lenovo servers and appliances. Using built-in intelligence, it identifies server power consumption trends and ideal power settings and performs cooling analysis so that you can define and optimize power-saving policies. The ThinkAgile HX Series appliances comply with ASHRAE class A2 specifications. The appliance performance might be impacted when the operating temperature is outside the ASHRAE A2 specifications. Depending on the hardware configuration, some HX7820 appliances comply with ASHRAE class A3 and class A4 specifications. To comply with ASHRAE class A3 and class A4 specifications, the HX7820 appliances must meet the hardware configuration requirement that processors with TDP more than or equal to 150 W are not installed. The ThinkAgile HX Series appliances can be configured with a three-, four-, or five-year hardware warranty with 24x7 ThinkAgile Advantage Single Point of Support (Lenovo appliance hardware and Nutanix software) and various levels of coverage with a well-defined scope of services, including service hours, response time, term of service, and service agreement terms and conditions. The ThinkAgile HX Series appliances include a three-, four-, or five-year software support and subscription (matches the duration of the selected hardware warranty period) that entitles customers to submit service requests to troubleshoot Nutanix software issues and receive code updates, including fixes, patches, and new software releases. Priority 1 (Emergency: Productivity halted): Within 30 minutes. Priority 2 (Critical: Significant impact on productivity): Within 2 hours. Priority 3 (Normal: Minimal impact on productivity): Within 4 hours. Priority 4 (Low: General requests for information): Within next two business days. The following table lists the Ethernet LAN switches that are offered by Lenovo that can be used with the ThinkAgile HX Series appliances. The following table lists the rack cabinets that are offered by Lenovo that can be used with the ThinkAgile HX Series appliances. The following table lists the power distribution units (PDUs) that are offered by Lenovo that can be used with the ThinkAgile HX Series appliances. The following table list the uninterruptible power supply (UPS) units that are currently offered by Lenovo that can be used with the ThinkAgile HX Series appliances.